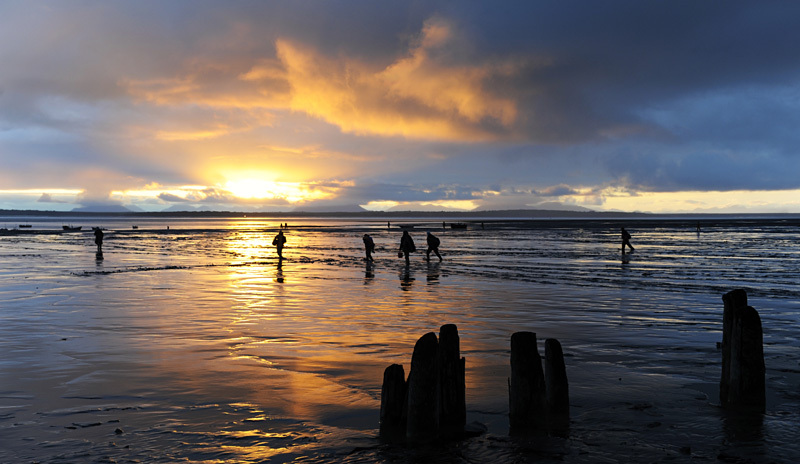 Nushagak Point fishermen head out to their skiffs to start fishing for the night. 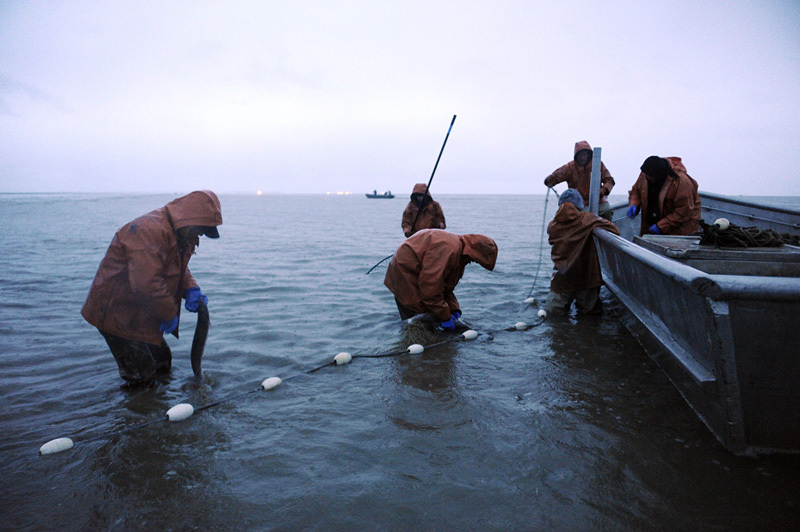 I’ve been working on a long-term photo documentary of the commercial fishery in Bristol Bay since 2007. This year will be my sixth year to return to the Bristol Bay watershed to both photograph and work as a commercial fisherman. It is by far one of the most intense fisheries I have had the pleasure to both photograph and work in. 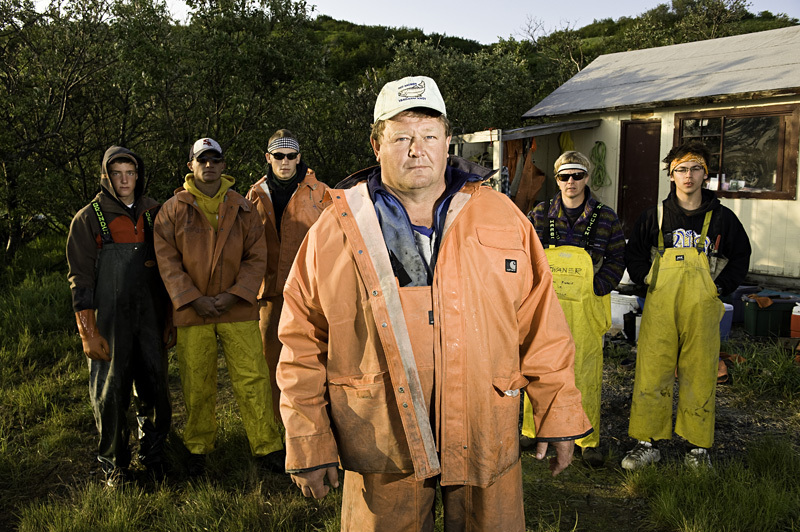 The level of camaraderie in the drift gillnet fleet is anything but friendly most of the time. It is such a high stakes bravado style fishery that few friendships are formed over the course of a season. If anything, more notes are being taken on who just corked you, than who gave you a few extra feet or seconds in your hook for that open line shot. Code groups, groups of fishermen who talk to each other using scrambled radio transceivers, are the closest thing the drift fleet has to friendly exchanges between boats. All the while as the drift fleet battles out each set; setnetters, or as we refer to them Mud People, have a true sense of community and a shared experience in their day-to-day fishing. 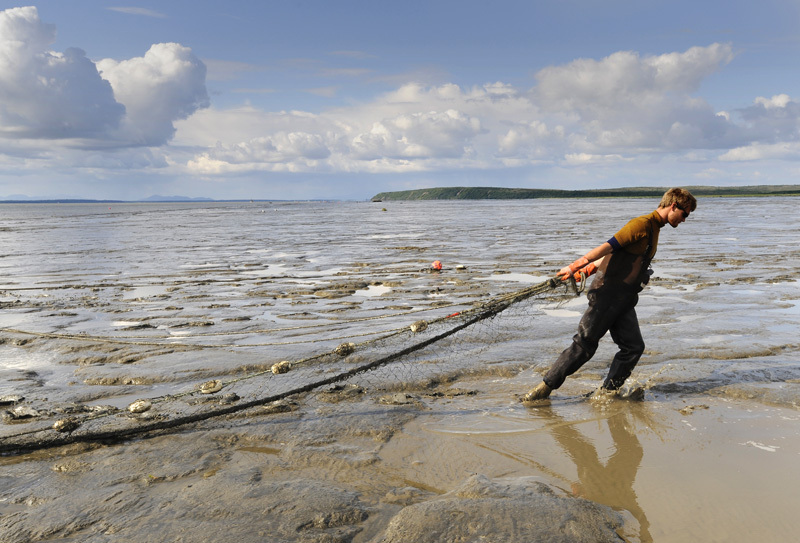 Commercial setnet sites dot the shorelines throughout Bristol Bay, from the mouth of Ugashik to the banks of the Nushagak. Their existence can certainly be a lonely and cold endeavor in some of the more remote areas of the region. However, a number of smaller collectives of fishermen exist throughout the watershed. 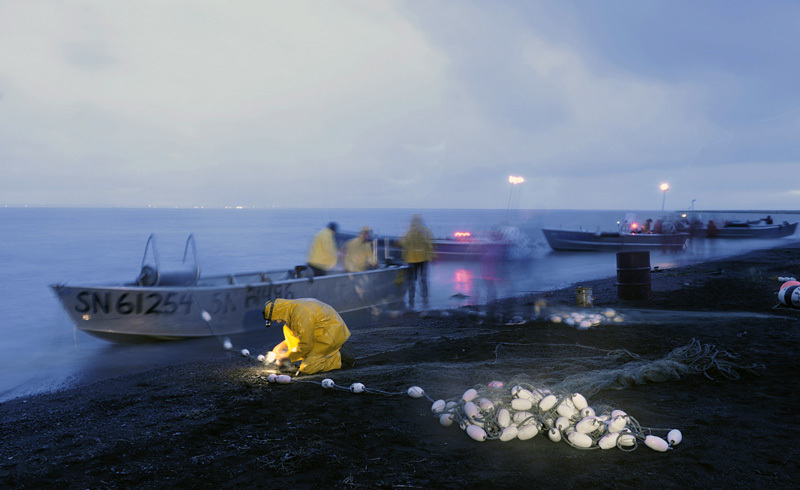 In 2009 I had the great fortune to spend a little over a week with Jon Broderick and his boys at Nushagak Point documenting the beginning of their fishing season. Jon is one of the founders of the Fisherpoet festival in Astoria, OR (http://www.clatsopcc.edu/community/fisherpoets-gathering) and a longtime Alaskan gillnetter. My time with Jon and his boys was bitter sweet. They completely endeared me to the setnetting existence in the mud. 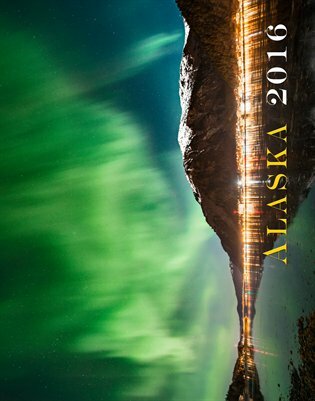 They have vast land and waters to explore, and cabins to return to at the end of their long days. Their cabins are simple affairs of 2×4 and plywood construction, the region’s notorious winter storms can drag a cabin miles down the beach; only to have to be drug back the next season. They work long days in open skiffs, returning to the same stretch of beach day-after-day. Some of their sites require the near constant moving of the net to anticipate the ebb and flow of the colossal tidal swings. It is a tough and at times dismal reality, which harkens back to the more romantic and less technologically developed fisheries of the past, albeit no less rewarding or challenging in the endeavor of harvesting fish from the sea. 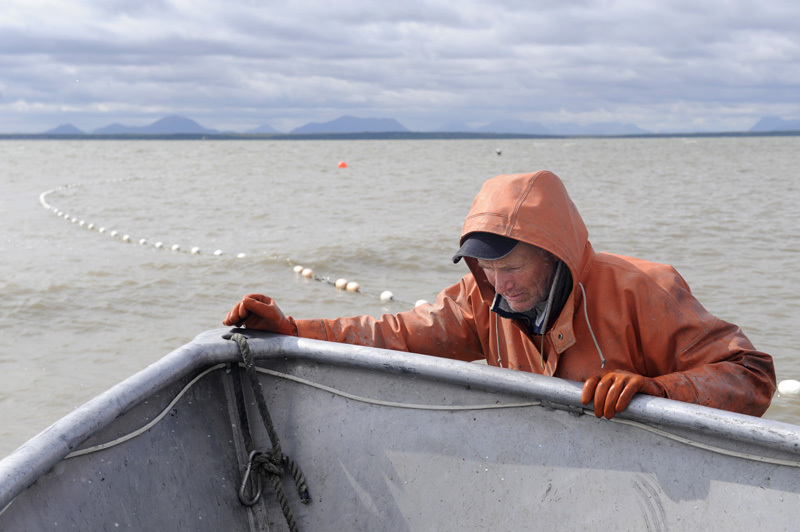 The experience I had at Nushagak Point is by far one of my fondest memories of the Bristol Bay commercial fishery, and will forever endear me to Mud People. 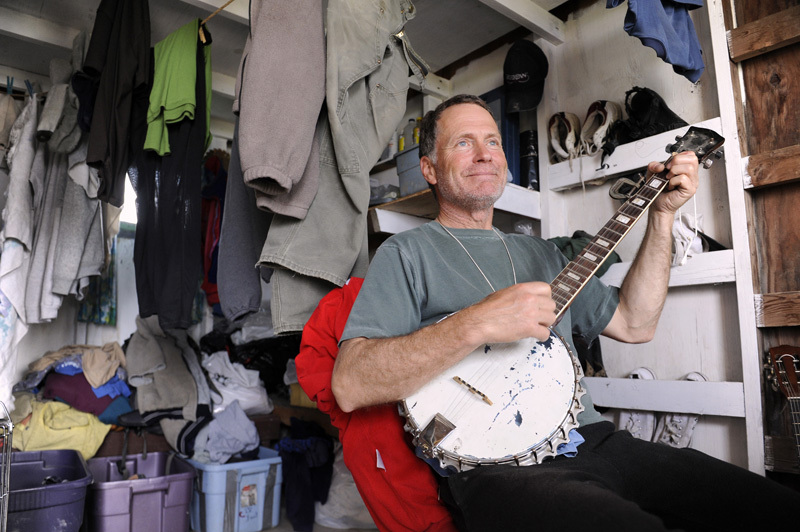 Jon takes a moment after a long day of fishing to play the banjo in his cabin. 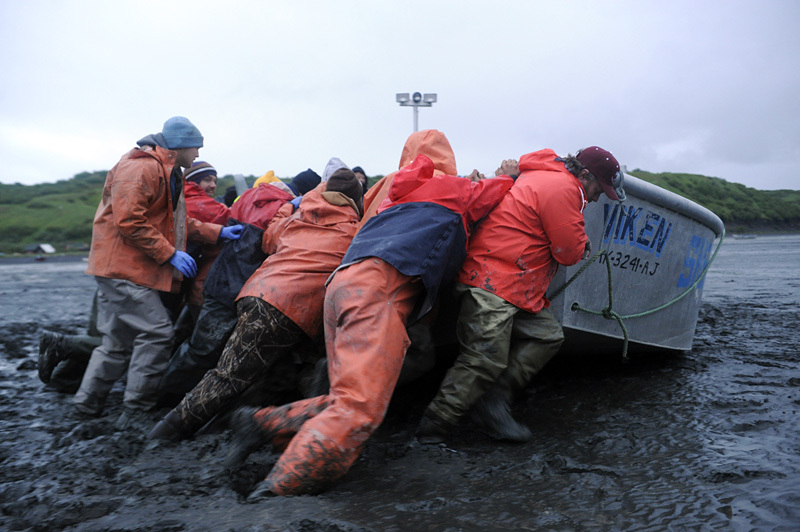 Fishermen pitch in to help free a fellow fisherman's skiff from the mud before an opener. 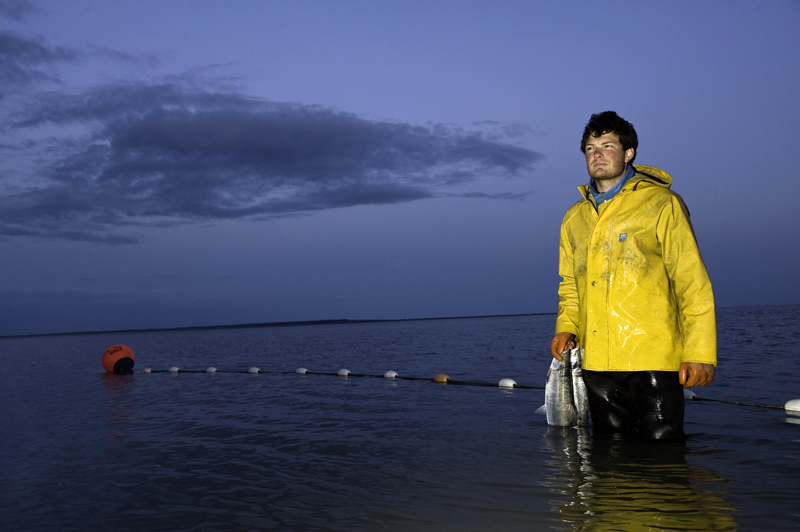 A "green" crew picks fish in the middle of the night during the first opener of the season. A fisherman hurriedly mends his net after a long night of fishing, so that it is ready for the next opener only a few hours away. Jon pushes his skiff out to run the gear. Max drags the net up the beach in advance of the flood, so that the net is in position for the incoming tide on the Combine Flats. 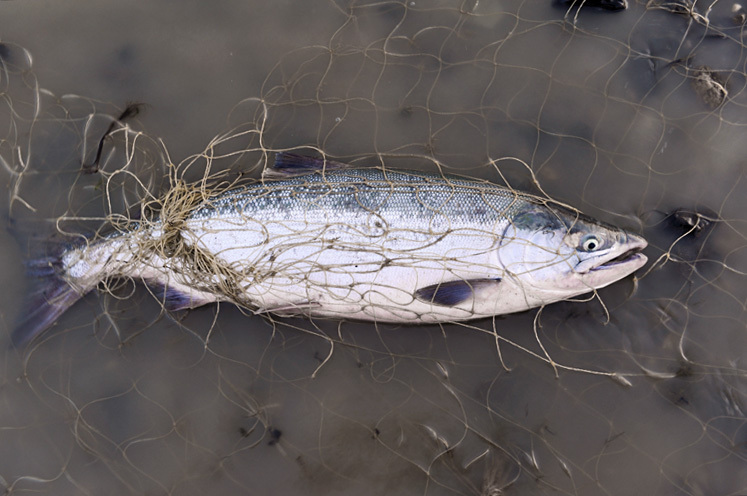 A sockeye caught in the net. Perry pitches fish into brailers. 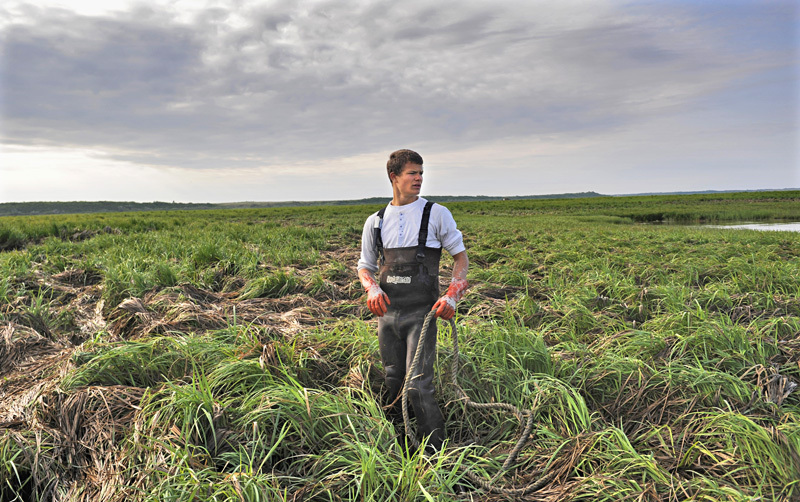 Henry waits for the word to pull the anchor from the grass, so the net can be moved out with the ebbing tide. Max resets an anchor in the mud. Perry holding sockeye freshly picked from the family's Coffee Point site. Lewis Finch, his wife, and crew in front of their cabin at Nushagak Point. 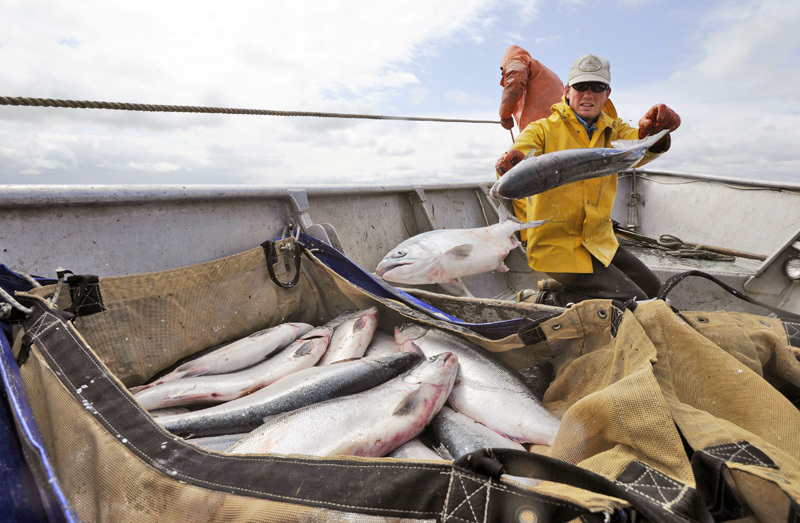 It's an all-hands-on-deck type of fishery, so no one escapes chores during the season. Brenna helps out her grandmother with the laundry. 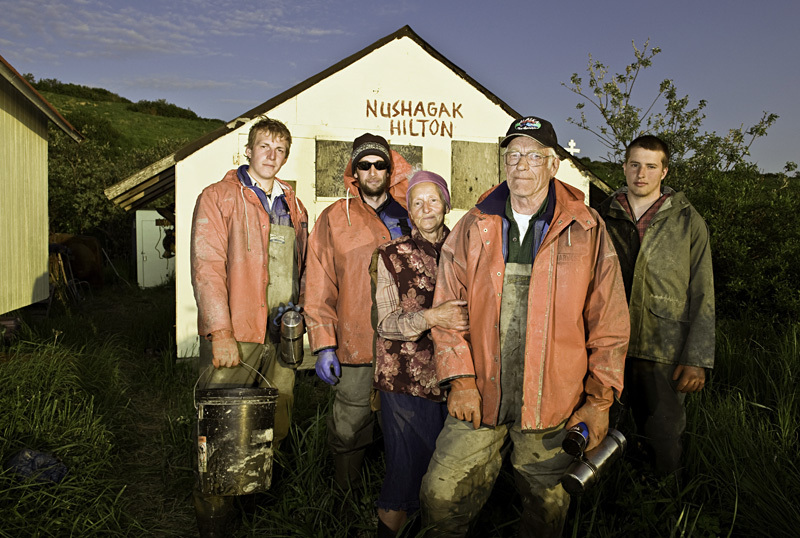 Curt "Ole" Olson, the unofficial Mayor of Nushagak Point, poses with his crew in front of his cabin. These are wonderful, Chris – such a very different world from what we’ve got here in SE, and fun to see Jon in his fishing habitat. Thanks for sharing. The first pic is especially amazing.
. I have Fished many places in AK. and have seen many of the scenes you have photographed. Heading up from WA. on May 1 for my crew job longlining, then on to the Bay to my own operation. I was directed to your site by the B-Bay facebook page. Keep up the good work and good luck fishing. Thanks for the kind words. 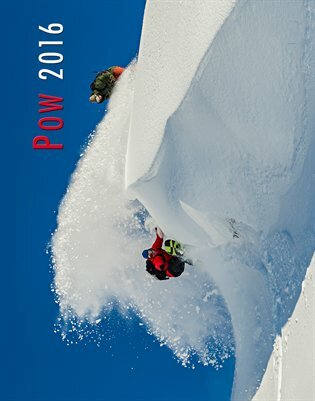 Have a great season up there this year. I’m on the Icy Bay, so if you see us try and give us a little extra in the hook and give a wave. The Picture of Brenna, reminds me of a Little House on Prairie version of Bristol Bay. I trust she is as pure and refreshing as she looks? From domestic chores to harvesting the run, it looks like there is never a dull moment for anyone during the season.